The Stephen F. Austin State University student chapter of the Wildlife Society defeated universities from across the state to claim victory during the Quiz Bowl held during the statewide Wildlife Society meeting in Montgomery. Pictured are members and faculty advisors of the SFA student chapter of the Wildlife Society following the Quiz Bowl win. 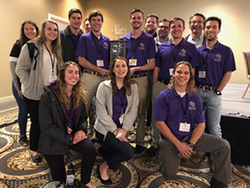 NACOGDOCHES, Texas - The Stephen F. Austin State University student chapter of the Wildlife Society defeated universities from across the state to claim victory during the Quiz Bowl held during the Wildlife Society meeting in Montgomery. "This statewide meeting provides the largest stage on which our students can showcase their knowledge," said Dr. Daniel Scognamillo, SFA associate professor of wildlife and faculty advisor for the student chapter of the Wildlife Society. "The students seized the opportunity and put their chapter and the SFA forest wildlife management program in the spotlight by winning the Quiz Bowl." "This win is a huge success for the chapter," said Jake Hill, freshman forest wildlife management major. "We're excited about preparing for next year and carrying on the winning tradition." The Texas Chapter of the Wildlife Society is the nation's largest chapter and holds a meeting every February in varying locations across Texas. Hundreds of wildlife and conservation professionals representing state and federal agencies, nonprofits, the private sector and academia attend the meeting to network and learn about the latest wildlife-related research.